Yesterday I talked about Grande yarn, a jumbo yarn like its cousin, Collage. Collage too qualifies as a jumbo yarn, but it’s slightly finer than Grande. Unlike Grande, Collage is all variegated yarn, so they complement each other very well. I couldn’t have picked two yarns that would complement each other better than these two. As I mentioned one is all variegated and the other is mostly solid colors. I love pairing variegated and solid colors together. 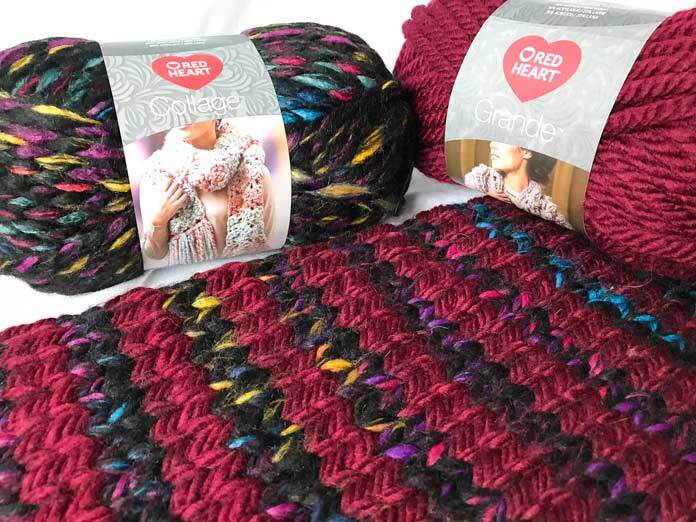 Remember the article from a couple weeks ago with the scarf where I paired two variegated colors together? I knit another scarf with the same stripe pattern, this time, using Collage and Grande. It looks so much different. The scarf made from Collage in the color Stained Glass and Grande in the color Chianti. Now there’s a slight variation in the size of the yarn. The recommended needle size for Collage is US 15 [10mm] which is slightly smaller than the needles recommended for Grande, US 19 [15mm]. 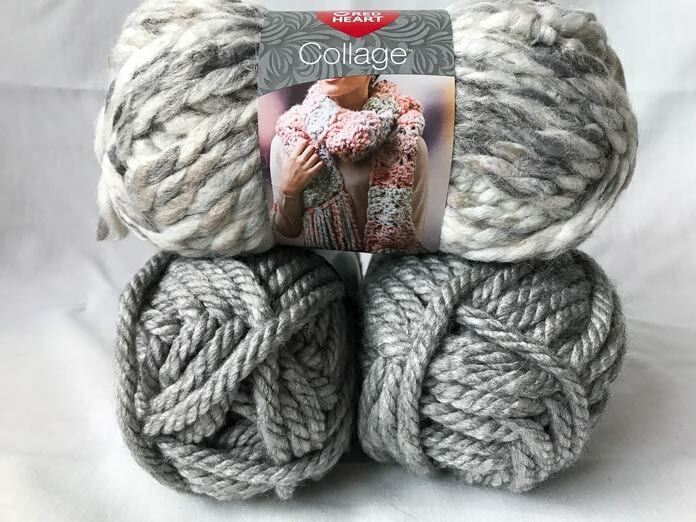 I actually didn’t notice Collagewas a little finer than Grande until I read the recommended needle size and felt the two yarns without looking at them. I just rolled them between my fingers without actually looking at which one is which. You can only feel the difference because Grande is a little bit denser than Collage. Visually they look the same, but Collage has more loft in the strand. This might be due to the difference in fiber content, Collage has 27% wool when Grande only has 22%. Using a little more wool will change the structure of the yarn and cause it to be twisted a little differently. A strand of Grande in the red and a strand of Collage in the black. They are a visual match. The color variation also causes a difference in the structure of each yarn strand. Each strand is dyed separately, then twisted together. As a result, the color is scattered throughout the strands giving the yarn itself a lot of movement. It makes me think of a really busy tweed yarn and I love that effect because it gives a really unique look to your knitted garments. It brings thoughts of cozy knitted garments, hot cocoa and fire-side reading. Let’s be honest, those things are in season right now. My lovely little photo-bomber. The blue from Collage in the color circus really brings out the blue in his eyes. I think he needs a little sweater for the winter. 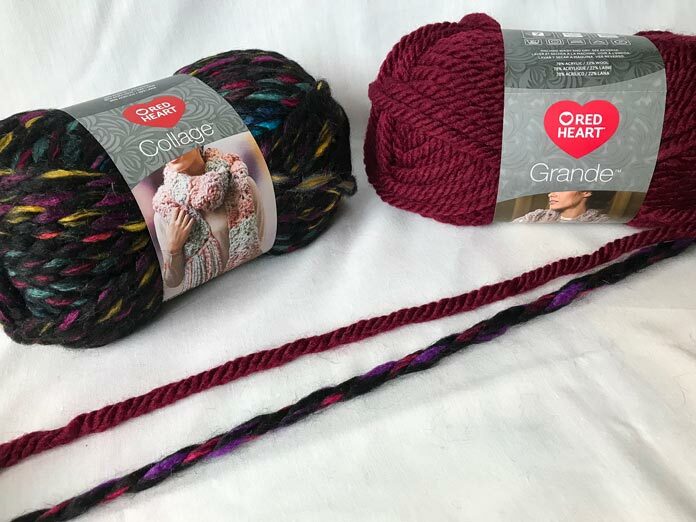 Along with all the benefits of using Grande yarn, Collage has colorful in the bag. While Grande is all about beautiful solid colors, Collage has lots of color and 8 different colorways to choose from. 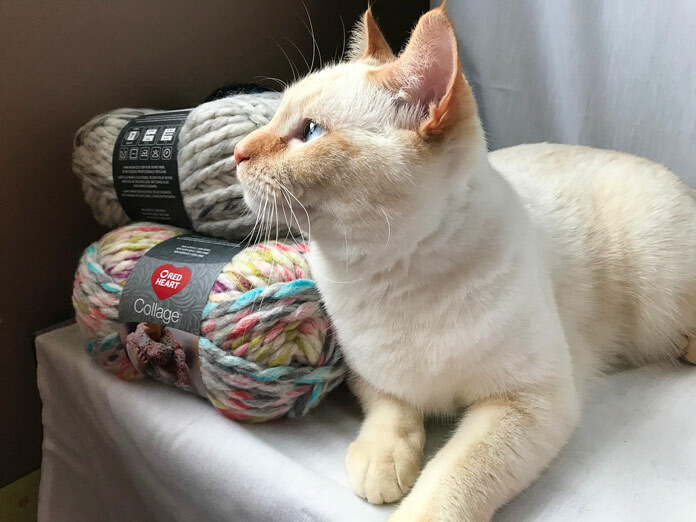 Right in the description on Collage yarn, it’s recommended to choose an individual color way or mix and match with Grande. These yarns were made to be matched together. This is part 2 of 2 in this series. FREE! KNITmuch Magazine Issue 5 Now Available!